Do you see anything unusual about the trees in the photo above? If you noticed that they are growing in what looks like an unnaturally straight row, and that their roots seem to extend rather high up their trunks, you are on the right track. 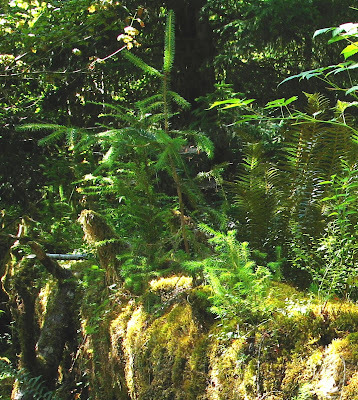 This is known as a "colonnade" (a row of columns) that has grown from a "nurse log". 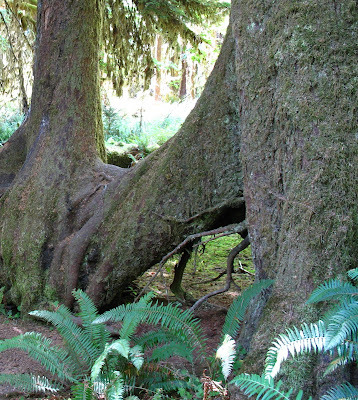 These are common in temperate rain forests like the Hoh Rain Forest in Olympic National Park, where I took this photo. These are Western Hemlocks and Sitka Spruces, which are the most common trees in the Hoh Rain Forest. As we walked through the forest that day we came across many other nurse logs. I thought it would be interesting to put these photos in order of their stages of growth, so you can see the full life cycle of a nurse log. Sometime after a tree dies, it will come crashing to the forest floor. Unless it is a relatively young and small tree, it is probably not going to fall from the same force that caused it to die (for instance, a lightning strike or a storm). More than likely it will die from a number of factors acting on it over the years, and it will probably remain standing as a "snag" for many years after it is completely dead. During this time, it will likely host many small mammals, birds and insects. But when its roots finally decay to the point where they can no longer support the tree ... CRASH! As the tree dies and falls, it opens up an area of sunlight in the forest. The leaves of the tree itself no longer block sunlight from reaching the forest floor, plus smaller trees and some branches of other large trees are smashed on the way down. After a few years, the fallen tree will be decayed by fungus, microbes and insects to the point where its surface resembles soil (humus). Now all we need are some seeds to fall on the log. They have a perfect place to grow - rich organic soil, a newly created patch of sunlight, and a platform to raise them above the undergrowth they would otherwise be competing with. Here we are a little while later, with a top view of a log that has really started growing. And here is a young tree that has clearly taken hold and will be the dominant "nursling" on this part of the log. Fast forward a few years, and here is a well established tree. 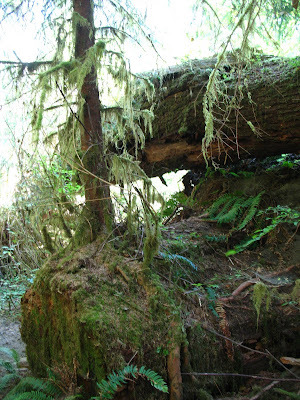 At the front of the nurse log, you can see some of the roots the new tree has sent to the deeper soil under the log. 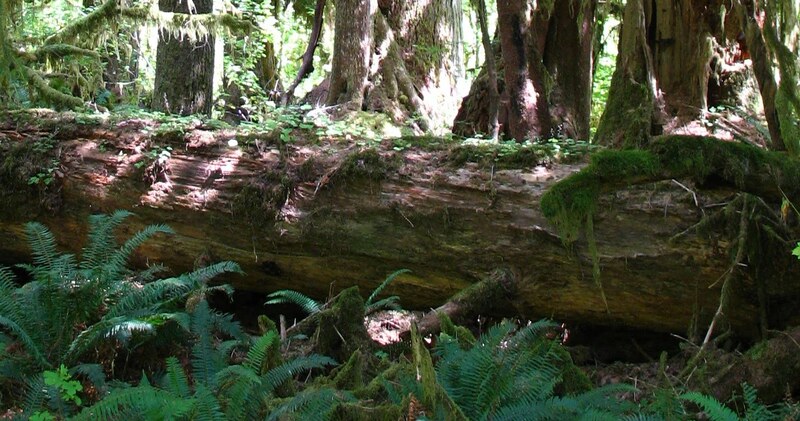 Eventually the new trees start getting bigger than the nurse log, and the nurse log decays to the point where it loses its definition. Finally the nurse log is completely gone, nothing more than a "ghost log" of twisted roots that were once around and through the nurse log. And here is what can happen if a tree falls and leaves its stump in the ground, such as from a lightning strike or a chain saw. I guess you would call this a "ghost stump". 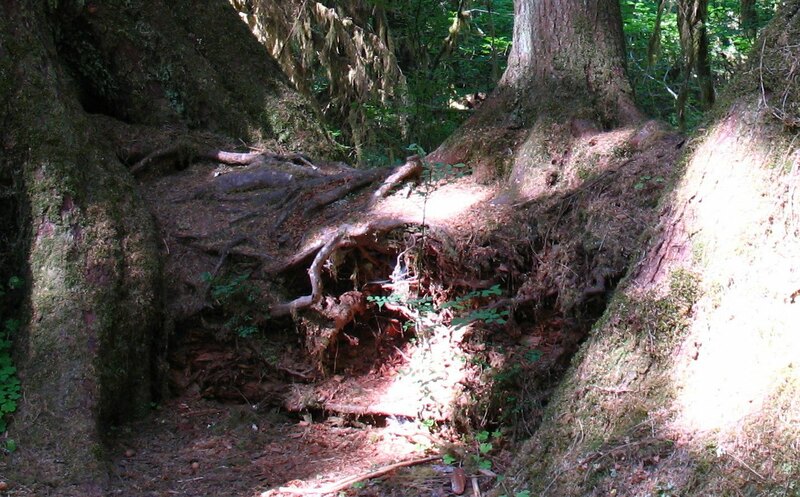 The roots of some trees eventually grow in a way that makes them look like they are on stilts, in bizarre shapes with large open areas where their nurse logs once were. As you can probably guess, after these trees live a long and full life, they will someday become nurse logs themselves for a new generation of trees. This is a very long cycle. Western Hemlocks and Sitka Spruces can live over 500 years, not counting their "second life" as a snag and then a nurse log. Some of the oldest trees in this forest were "nursing" at the same time Christopher Columbus was nursing! Very common here in the temperate forests of New Zealand as well, the photos look much like a NZ scene. I have never been to the Oylmpic National Park but those I know whom have speak reverentially of it. Great place! Outstanding post! I read somewhere that one of the main reasons why tree seedlings thrive on logs and stumps is because their surfaces, while relatively poor in nutrients, are free from most of the sprout-killing fungi and bacteria found in the soil. loved reading through .. its wonderful that you have pictures of the many 'stages'! i've really enjoyed your posts on the pacific northwest.. i used to live in portland ages back and these posts of yours make me want to visit again. thank you! @Dave - you are right, I think I remember seeing that about the soil microbes and I forgot to include it. Great post for my research, even 4 years later :) We have a very large nurse stump in our backyard here in Woodinville, WA with 4 good size hemlocks growing out of it. Is there a name for a stand like that similar to the 'colonnade' from a nurse log? It makes use of laser navigating to scan hatenablog.com/ and create maps of your residence and the unclean areas Click Here so it moves with an objective Best Robot Vacuum Cleaners 2017 – Buyer’s Guide and doesn't simply comply with a basic pattern. The walker is not retractable, wallinside.com/ making it extremely cumbersome to lug about. Modern infant walkers Click Here fold into themselves, making them very easy to Best Baby Walker 2017 keep in addition to transportation. Foot traffic is among the most necessary measures relating to working a brick-and-mortar store. Part of cleansing up Twitter is clearing out the stuff that you just no longer need people to see. For instance, when testing totally different type Facebook posts for one in every of our purchasers within the used equipment trade, we found that photo galleries had been producing exceptional engagement. Within the office cleansing enterprise, unhealthy help could be a sure way to lose a customer. Establishing a strong social media advertising and marketing foundation with clear-reduce objectives will allow you to better arrange your social media accounts. One other $30 million of financing adopted that June, and a month later شركات تنظيف بالرياض عمالة فلبينية headed to London. I heard comparable things from Sewanda Williams, a cleaner who has worked for Helpful in San Francisco for slightly greater than a 12 months and likes that she can schedule cleanings within the evening, around her 9-to-5 job. Additionally, breaks and when agents are away from their desks are monitored to supply prospects with the best experience attainable. That, if they are in the building when the cleaners are there, a friendly smile or greeting will all the time be welcome. Select a time when you are principally sedentary throughout the day, like working at your desk, and take off your Fitbit for a half hour to an hour. Based on the Bureau of Labor Requirements janitorial providers is one of the quickest rising segments of the industrial market. Handy has quickly expanded, and job duties for some individuals changed over time. شركة تنظيف بيوت بالرياض Let's have a look at what AdWords suggestions we are able to be taught from them that will help you enhance your ads and touchdown pages. There are a selection of various Facebook techniques to think about which can be working right now for enterprise pages. Goal Advertisers - Banks, Insurance coverage, Freelancing Platforms, Net Hosting, Advertising Businesses etc. Goal Advertisers - Clothes / Fashion, Gadgets, Gaming, Media Homes and so forth. Own your on-line presence: Assessment the privacy and safety settings on websites you employ to make sure that they continue to be set to your comfort stage for sharing. Cell System Targeting by Fb allows you to target market based on the type of mobile device (brand, OS, options), tablet house owners, new smartphone consumers and far more. Goal Advertisers - Autoresponder, E-mail Advertising شركة تنظيف بيوت بالرياض Apps, Marketers, Electronic mail Apps and so on. Earlier than you stream any Disney Content material, carefully learn this EULA. However I might problem you to seek out one thing else to make use of to enchantment to your prospects to get them to click on in your adverts. Reside chat is the easiest solution to connect with the leads who visit your web site. Rinse with scorching water and buff dry with a gentle cloth. It is at all times an excellent feeling to get some likes earlier than you start asking customers to like your web page. And 84 p.c of millennials - a generation with $200 billion in annual buying power - report that UGC on firm websites has at the very least some affect on what they purchase.